The Sunflower Seeds "Egusi" soup, prepared with sunflower seeds is a great alternative Egusi Soup. It tastes like Egusi Soup prepared with egusi seeds. Sunflower seeds are a great alternative ingredient for those who live outside Nigeria in a place where egusi seeds are not available. Preparing Sunflower Seeds “Egusi” Soup is easy, just replace egusi with sunflower seeds and use the same method of preparing the classic Egusi Soup to achieve similar results. The links below will take you to the classic Egusi Soup recipes and sunflower seeds will work with all of them. Watch the video below for how I prepared Egusi Soup using sunflower seeds. 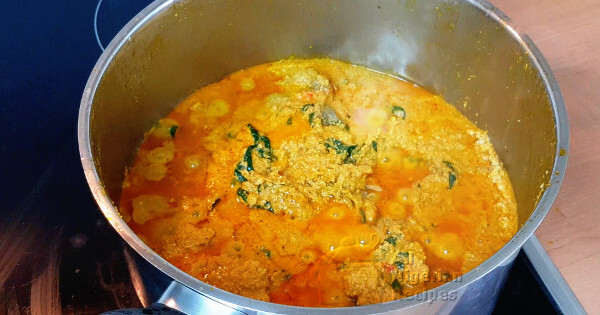 You can use all the ingredients you normally use when preparing Egusi Soup. Click the links above to go to your favourite Egusi Soup recipe. Just replace egusi seeds with sunflower seeds. For meat and fish, I used only stockfish. Feel free to add other meat and fish used for cooking Nigerian soups for fufu meals: shaki (cow tripe), ponmo (cow skin), dry fish, beef, goat meat etc. Watch the video below for how I cooked it or click on the links above to see how to prepare Egusi Soup. It is the same method but with sunflower seeds. The Sunflower Seeds Egusi Soup is ready. I served it with Spinach Fufu. It can also be served with Garri (Eba), Semolina Fufu, Amala, Cassava Fufu, Pounded Yam and the low carb fufu meals.